Room renovation often starts with tearing up old flooring and replacing it with something new. Before the work even gets started, you have to decide what type of flooring is going to work best with the new room’s decor. Ideally, you want flooring that is fresh and trendy. Luckily, there are lots of great options when it comes to the hottest trends in decorative flooring. Wood flooring remains to be one of the most popular choices among the room renovation crowd because wood is a classic material that blends well with so many types of furnishings. 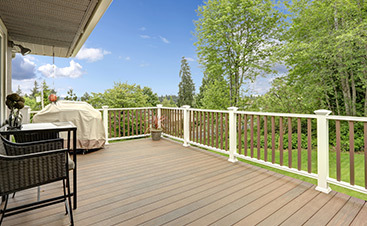 Selecting wood opens up a wide range of style and color options. You can choose among a bevy of wood grains with light, medium or dark coloring. Many people are going with American hardwood, bamboo and reclaimed wood. Don’t know which you would choose? Read on. America’s wood industry is still one of the best sources of wood flooring and, fortunately, good old-fashioned American-grown hardwood has captured the attention of remodelers again after being overlooked in favor of more exotic options. You can enjoy the beauty of hardwood flooring processed in an eco-friendly way that helps to maintain our forests for the long-term. 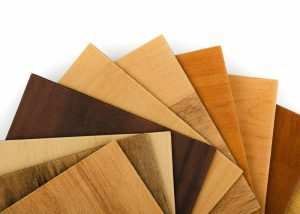 Another reason to make this choice is that American hardwood tends to be more affordable than imported varieties. One of the most versatile woods on the planet, bamboo is morphing into a style of flooring that is hotly in demand. 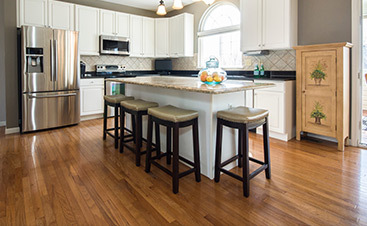 Bamboo fibers are now being engineered to mimic the look and feel of traditional hardwood flooring. If you’re torn between choosing bamboo or hardwood, strand-woven bamboo flooring offers the best of both styles. A great way to get that rustic look many seek is to fashion a floor out of salvaged hardwood. Unfortunately, using genuine reclaimed wood is cost-prohibitive for many. Fortunately, you can select factory-made reclaimed wood styles that look just as rustic as the real thing. For many, carpeting is the only way to go when choosing flooring for bedrooms, entertainment rooms and living rooms. Picking out carpeting used to be pretty simple. You use to have two choices, short-pile or plush. Thanks to the invention of the cut-and-loop style, carpet picking just got a little harder, but more fun! This artistic style of carpeting involves combining classic cut pile with a looping weave manufacturing method, creating any number of sculpted patterns that have a distinctive appearance. The patterns can be very subtle or quite dramatic. When you think tile you often see in your mind’s eye those perfectly cut 12” x 12” squares that fit neatly against each other, making a nicely patterned durable floor for the kitchen or bathroom. However, that is not the only option. Large-format tile is transforming the way many people think about this material – especially in the area of flooring. 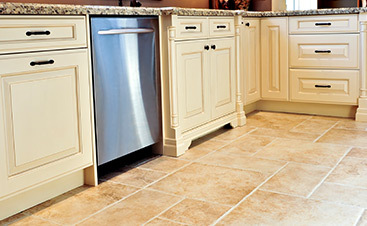 Large-format floor tiles appear giant-sized compared to what everyone is used to seeing. These heavy tiles come in sizes of up to 36-inches in diameter, and require professional installation to achieve a seamless spaciousness. Looking for something different? No problem. You don’t have to go down the same decor road everyone else does. These flooring ideas can offer you both luxury and versatility. The thought of installing vinyl flooring in your snazzy updated room may sound icky, but don’t turn your nose up at it just yet. Forget about that cheap-looking vinyl flooring that many homeowners turn to for do-it-yourself projects. Luxury vinyl flooring is in a whole other style dimension. We’re talking flooring so beautifully made that you can barely tell the difference between a traditional polished hardwood floor and its vinyl counterpart. Another thing you’ll love is how easy it is to care for compared to wood. Basically, you won’t have to sweat bullets every time your new vinyl floor gets wet. There was a time when cork floors were pretty bland. Thankfully, those days are long gone, and cork flooring has improved leaps and bounds. Cork has the advantage of being excellent for soundproofing a room. Cork floors are soft and comfortable to walk on, which makes it a good choice for cozy spaces. Best of all, cork flooring comes in an amazing array of modern colors and finishes. If your building has concrete flooring or subflooring, you’re in luck. It’s now perfectly okay to upgrade your existing concrete floors with contemporary concrete flooring. This style of flooring has a smooth, chic appearance that works with classic and upscale furnishings. The one drawback is its hardness. But, if the concrete is already there, sticking with the same material is a good money-saving move. Removing existing flooring, dealing with subfloors and installing new flooring requires expertise. Consult with a professional about the best flooring options before taking the plunge.